Desi Smith/Staff Photo. 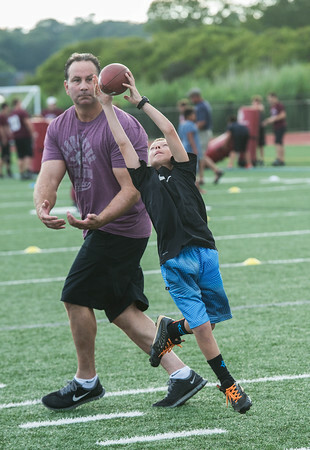 Jason Earl 10, leaps up to pull in a pass, as volunteer Joe Bolognese defends him during a pass and catch drill at the Gloucester Youth Fishermen mini-camp held Thursday afternoon at New Balance Track and Field at Newell Stadium. July 23,2015.